Winston 600 - Advanced Roofing Inc. The condo had a selection of systems Advanced Roofing submitted to meet their needs. Advanced Roofing offered a ponding water solution that did not require costly tapered insulation. Advanced Roofing had an in-house hi-rise GCI crane. Advanced Roofing was able to schedule project A.S.A.P. to meet the client’s needs. 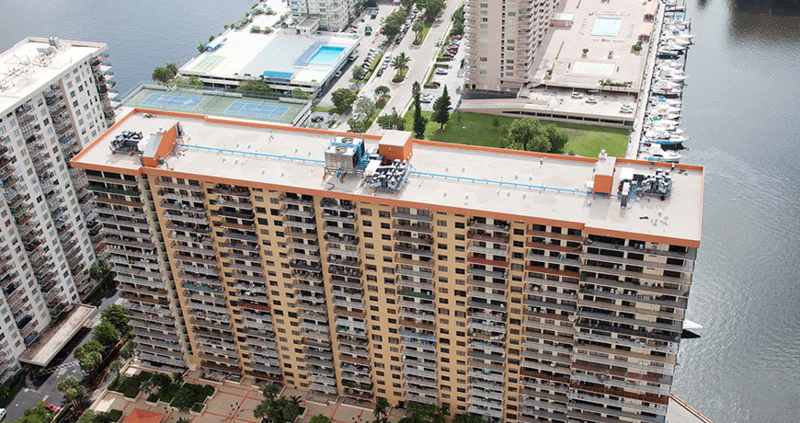 High-rise condos are Advanced Roofing’s specialty, so when Winston 600 Towers selected us as their contractor, we knew we’d have to be at the top of our game. Located in beautiful Sunny Isles Beach, North Miami, the 35,549 square foot Winston 600 sits just across the street from the Atlantic Ocean, and miles of touristy beach. The project ran from mid-January to early March. Towering at 24 stories and 250 feet tall, Winston 600 required a 260-foot GCI crane with a 2000 pound hoist. Advanced installed a Johns Manville Perma Mop System and the project was smooth sailing. With project manager Tom Hanzl, Construction Manager Mark Scotford and Foreman Jose Rodriquez, and GCI crane operator Alan Teto, the job came in on time and under budget, just like our motto. Even NRCA President Bill Good was impressed when he made a surprise visit to the site with Advanced President and Owner Rob Kornahrens mid-project. The project was finished three weeks ahead of schedule with no change orders to the original contract. Another condo hi-rise project finished “On Time & On Budget”.